Calculator Progress Update February 2012 We are about 99% completed with the development work for all 3 calculators of the Deadbeat Spreadsheet. All Calculators are working. Check out the Tutorial! Let us know what you think. These Server Side Calculators will be used to determine and track past-due and unpaid child support, alimony, attorney fees, court costs and any other Court decreed payable like moving expenses, interest, etc., over time periods between the decree date and for up to 30 years in the future. Just watch the video below to see how simple they are. This utility will include calculation tools that automatically compile and upon request, provide totals by month, year and grand totals with varying interest rates for all 50 states. The On Screen Calculators must include an interactive and straightforward pull-down choice menus for easy use and containing the necessary information which will be used to populate basic fields in the spreadsheet. Each page of this completed document-product will display caption able subject name, report date information and page numbers if applicable. All completed spreadsheets should include output shortcuts to selected printer, or Adobe PDF. The Goal here is to provide a tool, The DeadBeat Spreadsheet, that will better assist the tracking of an individuals performance (or lack of performance) of their court ordered Alimony or Child Support payments. Arrears Calculators: Free and Easy to use. 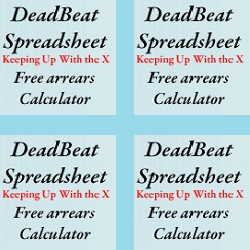 The Deadbeat Spreadsheet is a perfect example of Cloud Computing.